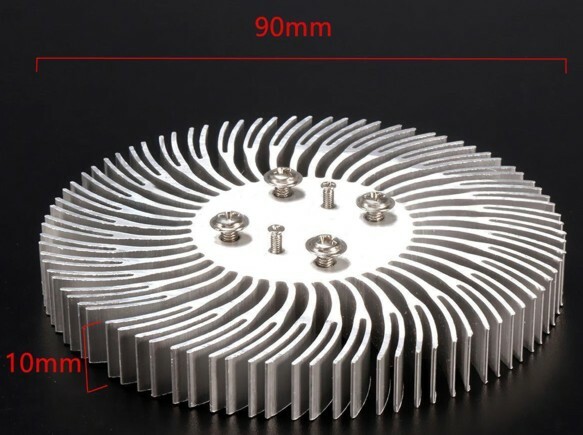 can I use this as heat sink for a DIY Led Project? Short answer? Yes, maybe, and no. How much heat are you planning on making? Most black box LEDs just use an aluminum plate that has no fins at all.. If its sufficient or not for your build depends on the specifics of your build..
no expert and thermal management is sort of part art,science, and trial ..BUT this is a bit of a "rule of thumb" approach.. If you want the LEDs to run a long time and be the most efficient, then 12 sq in per watt is a good "conservative" place to work. This will work for pretty much any LEd. The other end of the thermal area needed - about 1 in sq per watt - is on the aggressive side, and will result in higher die temperatures, somewhat shorter life, and slightly less efficient. you have approx 408 sq inches...thickness is really of lesser importance and adds little, at about "2W" of heat dissipation w/ the conservative approach..
Now that also assumes you are actually going to RUN them at 10W which, if cheap chips, wouldn't be recommended anyways..
12 sqi x watt ?? first off I want to say 12 sq inches per watt IS extreme but ssumes passive cooling..
BB's use 2 fans....and run about 2W at the diodes..
100W-ish is probably a more realistic "guess"..
180 sq " boards..Lets just say 2 sq " per watt w/ active cooling..
Reefbreeders use finned heatsinks and fans on some of their boxes.. It's a Mars Aqua hort light. much bigger than a black box though. Many use 3 fans for cooling..
Last edited by oreo57; 10/18/2018 at 01:45 PM. or 850 ma instead of 1000 and also installing 3 fan on the top should be ok? Not the best but ok? Personally, I dislike fans but a lot depends on where you put the lights.. You encoded? Open top ect.. I really don't think you will have an issue w/out the fans and lower currents...900-ish might push each to it's 10W depends on the chip..
to be honest, it's going to be a bit of trial and error..
What drivers are you planning on using? There are dozen of models of HLG120's..
anyways I guess you are planning on running the 10W chips in parallel to divide the driver output current.. Since most common 10W chips run around 34V V(f) and 120 drivers capable of that voltage have 4A or less available.. I suggest you run some tests if you already have the LEDs and drivers. Take some readings and see where the temp starts to level out. Surface area is the key but a small fan can make a big difference. Typically, LED intensity starts to diminish above 105 deg f and if you run them long over 135, they won't last. I've been using these 3.5 inch pucks that you can find on eBay. They have less than 10 sq in on each but there are (15) one watt LEDs on them, so.. far greater than the amount recommended above. There are no fins but i do have a small fan blowing on four of them. Without the fan they would burn up in a day or two. I put a temp probe on one of them and monitor it with the Apex. These are my refugium lights. If the temp goes above 110, I shut them off. I've attached the temp graph. I can't see that alloy plate being useful much at all. The life of the LEDs will be diminished greatly if they are not cooled efficiently. Basically, an LED produces a lot of heat behind the chip & this heat needs to be sucked, or absorbed away from the chip to keep the chip at a reasonable operating temperature. A heatsink absorbs this heat. But the heatsink must be able to cool quickly & efficiently itself so it doesn't over heat. If it can't cool rapidly enough its temperature gets closer to the temperature produced at the chip & its ability to absorb enough heat away from the chip is drastically diminished. So the heatsink cannot be made from a material (normally aluminum) that is too thick because it will hold the heat. As already pointed out fins greatly increase the surface area of a heatsink and that enables it to radiate heat - loose heat, much more quickly/efficiently. This is a heatsink I use. 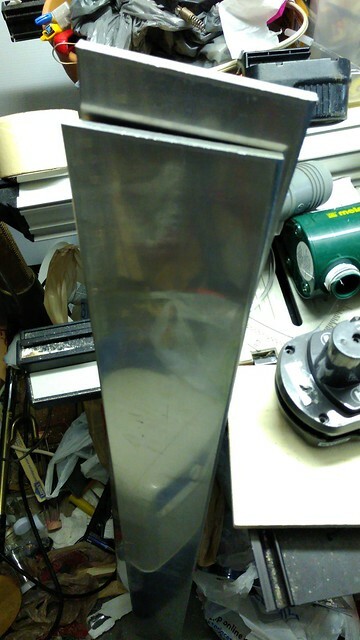 The base is only 2mm thick, & the fins 1mm thick. Did you buy that heatsink locally? FIRST I'm not arguing against "proper heatsinks" but this isn't exactly what you asked about. This is enough to passive cool 10W chips (at least for me for a few years b4 abandoning the build). Granted a lot of surface area and a lot of convection air movement arounfd the sink but not really very big. Temps would easily go over 120F..
Cree XLamp LEDs, is binned at 85 °C, so the relative flux data is based on 100% light output at an 85 °C junction temperature. That's 185F "at the core"...cheaper chips should probably be kept below 158f.. NOTE: That is at the core not the sink. Easiest "fix" if you think the chips are heating too much is just tweak the drive current down a bit..
Less current less heat but oddly the LED's become more efficient..
Oh and yes black anodizing.. and even black paint radiates heat off the sink better than a raw or polished surface. Not needed for fan cooled though. I've seen plenty of things that shouldn't work, work just fine..
Would it be my choice? No. But it's free, large and, if needed, can be enhanced w/ thermal pasting some fins on top..
Again, heat sinking is complicated and even manf need to do Real world tests over any calcs and guessing..
Last edited by oreo57; 10/26/2018 at 11:39 PM. The color of a heatsink plays no part in its ability to radiate heat (loose heat - cool down). A coating of paint will act as an insulation & restrict heat loss in fact. A black surface absorbs light energy better than another colored surface, though this has nothing to do with heatsinks cooling electronic components. I disagree and so does science..
have the heat sink surfaces painted or anodized to enhance radiation. Heat sinks cooled by natural convection may benefit from an anodized finish, but the added cost of the finish may not be justified when the part is used in forced convection cooling. Surface emissivity limits the amount of heat transfer due to radiation cooling. With 1.0 being perfect (black body) emissivity anodized aluminum is 0.85 and unfinished is 0.05. Heat transfer due to radiation is proportional to the heat sink surface area exposed to its surroundings and to the temperature rise above ambient (in absolute °K) raised to the 4th power (T Heat-sink - Tambient)4. In natural convection on small heat sinks with open fins, and a high benefit from anodizing by up to 45%. Relatively large extrusions and those used at low temperature rise, as in many high power applications, will only gain up to 10% by the addition of an anodized surface. With forced ventilation (using a fan) convective cooling is about 3 times higher than in natural convection. This changes the proportion of heat transfer due to radiation. An anodized finish will only add 4 -8% to the overall cooling effect in forced air. 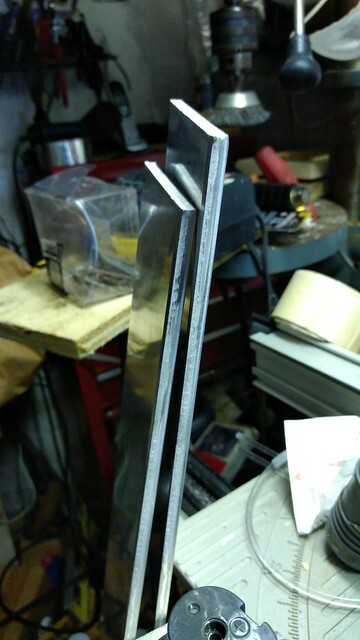 This percentage again, depends on fin spacing and heat sink dimensions. The color of the anodized finish makes little impact on emissivity since most radiational heat loss occurs at wavelengths higher than visible light. As a thumb rule, if anodize is not required for aesthetic or corrosion protection, we suggest it only for small, open finned heat sinks in natural convection. Like I said, w/ fans.. not an issue..
Last edited by oreo57; 10/27/2018 at 10:19 AM. Oreo57, let’s take a closer look at the info you posted. You then quoted, - “A shiny metal surface has low effective emissivity”. But areo57, you cut that quoted sentence short. Yes, a flat black surface is just that because it rough, it has greater surface area & absorbs more light. 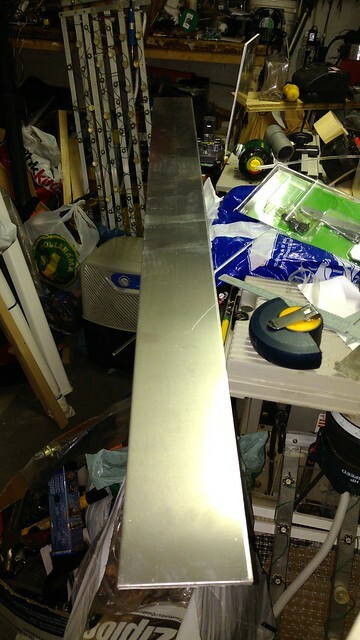 Whereas a shiny surface is shiny and reflects a lot of light because it’s smoother – less surface area. The greater the surface area the greater the radiative cooling (i.e. fins). Also think of it this way, -how shiny is that metal surface in pitch blackness? An object has no color in the dark. In the dark how could color possibly have any effect on its radiative ability? Surface area does affect radiative ability, in light or darkness. The author neither states why or how “painting” or “anodizing” enhances radiation, or the color the paint or anodizing should be. Black is not mentioned. But, further along in the article it is stated, & I quote “The color of the anodized finish makes little impact on emissivity since most radiational heat loss occurs at wavelengths higher than visible light." Believe what you want to believe.. Black Anodizing increases passive cooling. Yes other colors help too. Under natural convection conditions, the performance of a heatsink with a black surface will be 6% to 8% better than that with a plain or bright surface. However, this differential disappears under forced air conditions. Yes, it's complicated but I stand by my general pricipals in regard to passive cooling..
To test the influence of thermal radiation on the total heat transfer in buoyancy-induced convection, an untreated and painted/anodized version of each heat sink was tested. Both painting and anodizing increase the emissivity of the heat sink and, consequently, the heat transfer by thermal radiation......Figure 8 compares the thermal performance of the untreated finned heat sink, the 22 mm-high in-house-made aluminum foam heat sink (reticulated22) and the 22 mm-high solid aluminum block to that of their painted/anodized counterparts. By painting or anodizing, the thermal performance improved for each of the tested heat sinks. The aluminum foam heat sink, the finned heat sink and the aluminum block, respectively, dissipated on average 17%, 31% and 44% more heat after they were painted or anodized. Last edited by oreo57; 10/27/2018 at 09:46 PM. Just to quote again from the article you supplied - “The color of the anodized finish makes little impact on emissivity since most radiational heat loss occurs at wavelengths higher than visible light." so again I'll ask; how could the actual color of a heatsink affect its ability to loose heat when operating in an environment of near dark, to, & especially, total darkness? It is light that gives an object its color; the color spectrum that an object cannot absorb, but reflects is the color it appears to the human eye. So in near, or total darkness a heatsink has no color. A black surface has a greater surface area than other colors & absorbs more light. I never suggested that. But painting a heatsink is never recommend because the paint, especially the thicker the coat, will act as an insulator & inhibit the heatsink from cooling.